Many of you have been involved in earlier DIFD games during the last two years, but here's a little background information if you haven't. DIFD is a grassroots movement that was formed after the tragic death by suicide of Daron Richardson just before Thanksgiving in 2010. Following Daron's death, her friends, teammates and parents joined together to form DIFD in the hope of encouraging youth to take care of their mental health. There are 3 basic goals of DIFD: Raise Awareness, Inspire Conversations and Transform Youth Mental Health. By focusing on these, it is hoped that events like our can erase the stigma associated with discussing mental health so that our youth can begin to talk about how they are feeling and ultimately get the help that they might need. You might wonder, why DIFD? 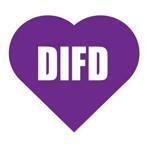 DIFD has done an amazing job of making resources available that are specifically geared to our kids! Their robust website that is rich with resources, their app: Health Minds helps any youth navigate through their feelings and come up with solutions; DIFD's newest app: Be Game Ready helps hockey players become mentally prepared for their games, not just physically prepared. I ask you to explore this last one with your hockey players. Hockey is an emotional game, and Daron's Mom, Steph, specifically asked that we do what we can to get this clinically developed and tested app into as many hands of hockey players in the US as possible. So, these are just a few of the reasons that we believe DIFD is a great platform to use to talk about mental health with our kids. We all know enough tragic stories to know that it's important for our kids to take care of their mental health. 3rd Annual DIFD Dublin High School Hockey Event: This is the 3rd Annual Dublin High School Hockey DIFD event. Historically, the symbolism of hometown rivals Coffman and Jerome coming together to support this important initiative has been huge! We began this Dublin rivalry in support of DIFD because two years ago, some players on both teams had played hockey with Daron in their early years. Those kids have moved on to college now, but we keep this tradition going and growing so that we can keep the imporant DIFD message and tools in front of our Dublin youth! If you'd like to help out on Sunday anytime from 3:00 - the end of the games, please let Renee Jordan know. Much of the help will be provided by Jerome and Coffman students, but involvement from parents is welcomed! For your players: in recognition of the event, we'd encourage them to wear purple as part of their pre-game dress. It might be a purple tie, shirt, vest, anything to acknowledge the DIFD event. On Wednesday, again, we'd like to Varsity players to wear purple to the game and to arrive 30 minutes earlier than coaches require for a photograph of all the varsity players on both teams. We've done this the past two years, and it makes a great visual of the rivals being teammates when it comes to supporting the DIFD cause. All of your players will receive a DIFD wristband for free that has DIFD on it, as well as a crisis text hotline number so that if they or their friends are ever in need, help is only a text away. Together, we can help to raise awareness, inspire conversations and transform youth mental health. Through events like these, we can remove the stigma to make it normal and okay for our kids to talk about how they're feeling! NBC-4 - Monica Day's (@NBCMonica) segment on DIFD. See your team trustees or e-mail Kelly Ackley at orgsec@dublinhockey.org to purchase the items below. ©2019 Dublin High School Hockey Association / SportsEngine. All Rights Reserved.